Thank you. I love the quote from McLuhan. Well said! And everyone knows that an Apple Borg is better than any other kind of Borg. It’s inevitable. Pingback: Who Really Believes in “Permissionless Innovation”? Excellent piece. Incidentally: what’s amazing is the degree to which people don’t even discuss whether MOOCs work. It’s just irrelevant to them. “There is absolutely no inevitability as long as there is a willingness to contemplate what is happening.” Marshall McLuhan -Love that quote! Resistance is not futile. As long as we keep asking how and why. I think people tend to misunderstand one of McLuhan’s other quotes, “We shape our tools and THEN our tools shape us”. I don’t think he ever meant it to sound like cause and effect. That was never his way. The quote was probably meant to be understood as, “We shape our tools and our tools shape us”. The difference is the constantly shifting push/pull friction between the two. It’s like tug of war. We develop/reflect/respond/reshape technologies and society and at the same time, are continually reshaped by them. It’s the willingness to contemplate what is happening that keeps the push/pull constant and healthy. Explicit assertions and implicit assumptions are made by people who have dropped the rope. You must not have seen all of the Borg. After destroying all of Star Fleet Command and that was a frightful thing to see! Captain Kirk and his crew showed up, rescued the Borg 7, everybody with hormones loved 7, and destroyed the Borg. End of threat. Piece of cake. Captain Kirk cheats death. He does not believe in a no win scenario. He was the only person to beat Spock’s Kobayashi Maru. He wrote a subroutine that ended the program and there was no contingency recovery. He only had to tell Ohuru to enter the right command. Something like prepare sick bay. The enemy ships were just sitting there and he picked them off one by one. Hint, the Borg collective. How many viruses and malware are executed on a given date? End of the Borg collective. The doomsday device is already in place. You have no idea how many people work on the same software. Managers don’t have a clue. Obviously, the sci-fi origins of the Borg mean that it makes sense to apply the term you’ve coined to technological determinism. But could it be extended to any rhetoric that argues that hegemonic perpetuation or even acceleration is inevitable? As an example, your use of MOOC brought to my mind the claim that there’s no way to stop the transformation of humanities academic positions becoming primarily part-time, sessional work, as a result of the pervading economic forces in the academy at large. how about the rhetoric within Tolkien’s writings? The evil lord cannot win without the creation of machinery and factory-made fighting creatures. The lands of Middle Earth will continue to be stripped bare in order to ensure the survival of the machines, because they are the tools that belong the new world, and its leader. All goodness, and the good will of men will eventually dissipate, because they are of the old world. It’s well known that Tolkien hated the mechanisation of humanity. He saw its results in the devastation of the two world wars and this was reflected in the LOTR. He was laughed at by his academic colleagues who would regularly ask how his ‘fairy tales’ were going. Ironically, it would be their departments that 100 years later would threatened by the MOOC movement. Perhaps it is a self-fulfilling prophecy, or perhaps, as is with all prophecies, there is a carrot dangling before it, and I would argue that it comes down to being simple business model. Follow the money. Gadgetry is the norm for great amounts of profit. Absolute agreement… this absurdly dogmatic autopilot approach to the direction of the world is terrifying. “Borg Complex” really is a sweet bit of coinage! This discussion of the “Borg Complex” is certainly complimentary to my exploration of Digital Determinism in Freeloading. And I nearly used the same McLuhan quote as an introduction to the book. Interesting read. Some people do not want to be assimilated, and their wishes need to be heard and respected, right alongside those who do want to be assimilated (like me!). This list is spot on (except for option 1, there are very few unsupported claims, but that’s not the point). Too often there’s so much enthusiasm for technology, that we Borg often forget that some people don’t want it, and dismiss them as “irrelevant”. They aren’t! Google Glass is a perfect example. I’m ordering mine as soon as I can, but I want to use it in a way that respects the rights of others, the privacy rights of others and the rights of others to leaves their bodies as they are. Google Glass is just the start, soon it will be implants. And people need to have clear choices on when to receive such implants. There should be laws restricting implants for minors unless medically necessary, because the choice to leave one’s humanity behind should never be made for you. Before receiving any implants you should be appraised of all the things you could lose, including your humanity, or being at risk of “brain-malware”. By the same token, humans who chose to remain human should be apprised of what they will lose. Namely, the opportunity to take the next step in our evolution. Some monkeys came down from the trees, many hundreds of thousands of years ago. Some stayed. Everyone deserves the right of a clear, informed choice of whether or not to go or stay, free of propaganda or coercion one way or another. But make no mistake, those who go will be a different species, just as different from humans as humans are different from monkeys. The question is, what are you willing to give up to take the next step? You may not want to give that up, and that’s everyone’s choice. It has to be. If the Star Trek Borg only took volunteers (as Seven of Nine suggested to the Queen), they would be good guys. Instead they assimilate without consent, therefore they are the bad guys. They would still be the most technologically advanced race in the galaxy either way! We can be good guy Borg, not bad guy Borg, if we want to be. The Amish are thriving on their Amish communes. Life is not perfect for them but it is the life they choose. Thy have every right to make that choice. And everyone else has every right to live in the modern world. By the same token, anyone has the right to decline transplants (unless you are gravely ill with some awful disease and the only way to save you is nano-bots, or a robot heart but that’s a special case, and you can decline and choose to simply be ill if you must). And anyone has the right to go out and get Google Glass, and get transplants when they come along in a decade or two. 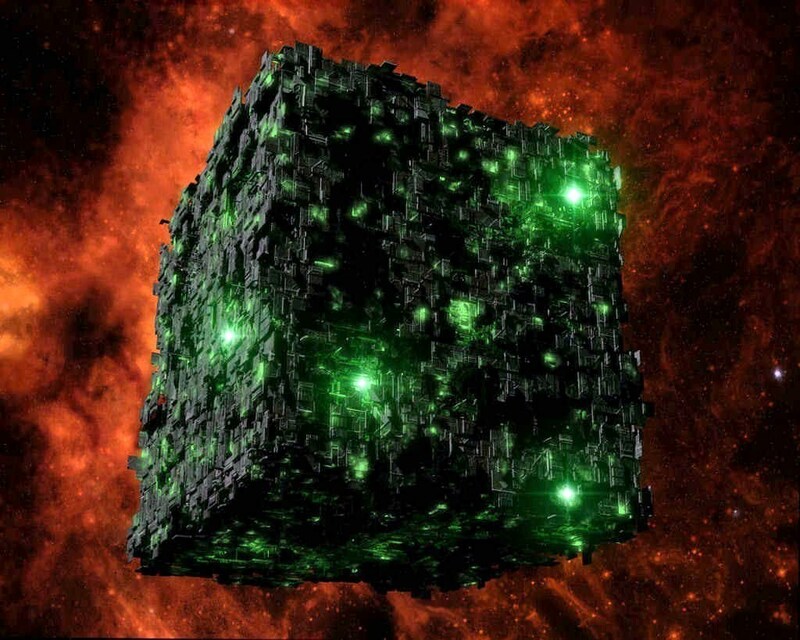 The fundamental problem, both with the Borg complex and your response, is the assumption of human agency – that we are controlling the process. We are not, it is controlling us. Or, we are part of a process that we barely understand, let alone control. I’m not unsympathetic to this claim. I would not argue that it is possible for us to achieve anything like god-like mastery over or situation or that we should strive for autonomous agency. That said, I think it is also a mistake to abdicate responsibility and judgement altogether. This is a black hole. I will respond when less hung over. How to be, as opposed to how to react. Pingback: Hexbyte Hacker News Computers The future’s so bright, I gotta wear blinders | HexByte Inc.